Thanks for stopping by the blog, I hope you had a great weekend? 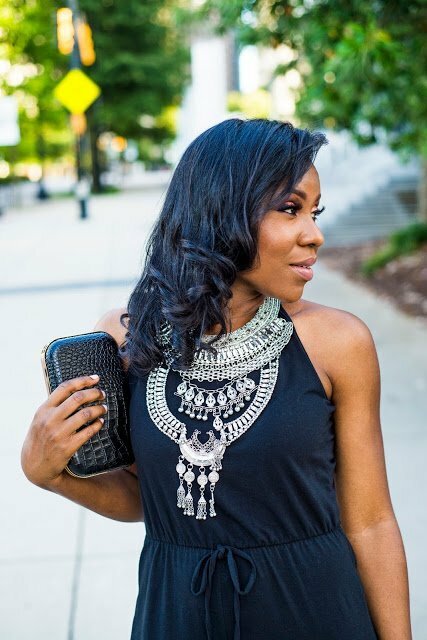 I am sharing part two of my collaboration with fellow Atlanta Blogger, Stiletto and Pearls, see our first look here. We decided on formal wear for our second look to give you style inspiration for your next major event. We both settled on classic formal wear colors, Navy blue and Black. My dress is also available in white and is currently on sale for $21.50. (There are still a lot of sizes available.) The off shoulder trend has been huge this summer and it is still going to be, for fall. I love the ruffled lace details. This dress runs true to size and it is very comfortable. Yawa’s gorgeous dress is currently on sale for 15% off. It is also available in plus sizes. See all my shopping links for details. Thank you for reading, please leave a comment if you have any questions or let me know what you think of the looks. Thank you, have a nice day! Oooh, I really like both dresses. Especially Yawa's curve-enhancing one.